By a coincidence, we (Rob and Anika) each stayed at one of the two London InterContinental hotels over the last ten days. We thought it would be interesting to do a ‘compare and contrast’. 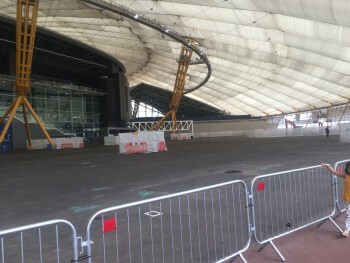 Today, Rob looks at the brand new InterContinental London O2 where he spent the Bank Holiday. 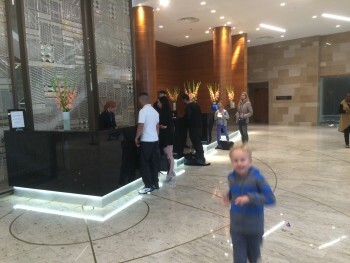 Click here for Anika’s review yesterday of the flagship InterContinental London Park Lane. 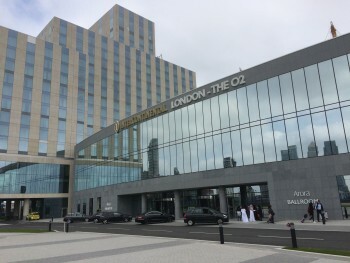 This is my review of the brand new InterContinental London O2. Why was I here? Good question. A Bank Holiday weekend loomed and the kids wanted to go away. With a flight abroad planned for next weekend, however, the parents didn’t want to go far. The new InterContinental London O2 was recently cut to just 45,000 IHG Rewards Club points per night. For cash, it can be as cheap as £104 – literally 75% cheaper at times than the Park Lane version. Feedback from friends was positive and, as it has a swimming pool and is very close to the cable car, we thought it would be fun for a night. The world of the Greenwich peninsula certainly feels a million miles away from the Victorian street we live on in West London. My InterContinental Ambassador status got us a guaranteed 4pm check-out so a one night stay was effectively 26 hours in the hotel. That made it long enough to feel like a bit of a break. For clarity, we booked this using our own IHG Rewards Club points. 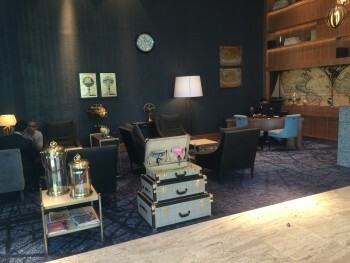 Unlike our other recent InterContinental reviews, IHG played no part in arranging the stay. The hotel has a few oddities which I will go into but, for clarity, this is an exceptionally good hotel with impressively furnished rooms, great views (at least on the Thames side), a lovely pool, a good mix of restaurants and is astonishing value for money at £104 when available. Once you’re inside the hotel, it is great. You will be a bit worried about what you are getting into until that point. Coming from North Greenwich tube, you are directed along the side of the O2. First you pass a building site, then you cross the O2 service road and a roundabout, then you walk the rest of the way on a pavement that has not been completed yet and is still rough gravel. When it rains it must be pretty woeful. Let’s forget all that. It is best if you check in and don’t leave again unless necessary! Let’s be clear from the start – there is NOTHING about this hotel which is not an improvement on the InterContinental Park Lane. If you dropped the hotel down in the West End it would be a huge success. Owners Arora (who also own the Sofitel at Terminal 5) are either mad or hugely optimistic! 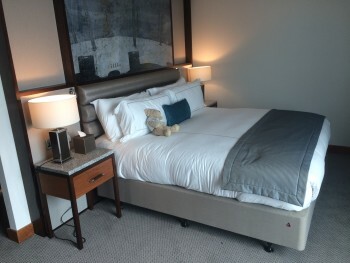 Our two standard rooms were upgraded to a Riverview Suite and a connecting Deluxe Room. We had to wait an hour for the suite to be ready – it seemed to be the only connecting room available – but we were glad we did. I have Ambassador / Spire Elite status which is what drove the upgrade. It had nothing to do with HFP. 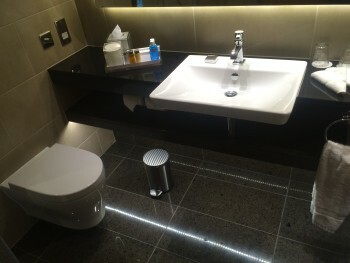 The suite came with mouth wash, a razor and tooth brush – apart from that the amenities seemed the same across the two rooms. Toiletries were the Anne Semonine brand, different from Park Lane but the same as I got in Le Grand Paris the week before. It is all very impressive, especially the artwork above the bed. Apart from the sofa, the suite was not very different – and not massively bigger – than the connecting Deluxe room. I would suggest that a Deluxe Room with lounge access is a better deal (at a similar cost) than a suite without lounge access. Purely for Anika’s benefit, I will note that all rooms except the basic Superior ones have Tassimo coffee makers as well as a kettle (and some very high quality tea). You don’t even get a coffee machine in a Studio Suite at InterContinental Park Lane. Unbelievably for a new hotel, they have messed up the plug sockets. The desk only has one free UK plug socket. There is a round-holed 3-pin socket for a light but the hotel then went and bought normal lights which take up one of the two standard sockets! One side of the bed also has no plug sockets at bed level (there is one if you push the bedside table out the way) which is not acceptable for a new hotel in 2016. 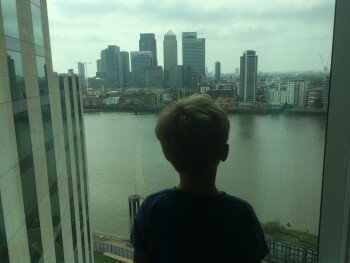 Click here to read Part 2 of my review of the InterContinental London O2. The hotel website is here if you want to find our more or book. The roof top bar is open and very pleasant. Having club access you cant have free breakfast at restaurant but only the club,with time the club will extend its opening hours,i ve stayed 3 times and no more than 6 persons at the same time in the club. This property is far more generous than Park lane,Royal ambassadors got the choice of upgrade to Suite or free club access. My mate has his breakfast in the restaurant! To be honest, the quality of the furnishings doesn’t look very good to me, at least in the pictures. The sofa looks flimsy and cheap while the bedding looks a bit shabby and uninspiring. Does not compare well to CP Aberdeen Airport, for example, I stayed a few weeks ago at under £40 a night. The photos are misleading. To be honest, when I uploaded them, I thought the same thing! There are plenty of Photo Sphere images in google maps. I was here at the weekend and was quite impressed. We were allowed to have breakfast in the restaurant with having club access. The strangest thing was you couldn’t see the TV from sitting in the sofa, so ended up shifting the room around. The sofa bed is the heaviest in the world!! Raffles, you’ve expertly caught the reflection of the top of my home in the Ballroom picture! Living close by, curiosity has got me and trying out the hotel this Friday (cheap rates despite a show on). Hopefully my newly obtained Ambassador status will be honoured correctly. There is a USB socket, to be fair. The irony is that, whilst we booked two rooms, because one was upgraded to a suite with a sofa bed we would have been OK with one! For review purposes it was useful having access to the Deluxe as well (and we got more coffee pods!). You can check this easily. Go to ihg.com or hilton.com and do a test reward booking for, say, November in London for 2 adults and 2 kids. You will see that 90% of hotels disappear but some remain. With Hilton, Park Lane and Canary Wharf have basic rooms that take 4. With IHG, there are a few options such as the Holiday Inn Camden Lock. You will get something if not picky. Outside big cities there is a trade-off – basic rooms are normally larger (so more chance of them taking 4 people) but on the other hand there are far fewer properties per city to choose from. Remember that you can always try emailing the hotel and asking if they will upgrade you for a cash supplement, which might be modest, to a room which would take four. I stayed here over the weekend and really enjoyed it. I live in central London and it proved to be the perfect hotel for a London “staycation”. As a Gold Ambassador I received the fruit and water amenity, 4pm check-out, room upgrade and an in-room movie. We partook in the 5 course tasting menu at the Peninsula restaurant (which was excellent). The 50 per cent off food promotion at Peninsula is running until the end of August but you need to ask for it at check-in. 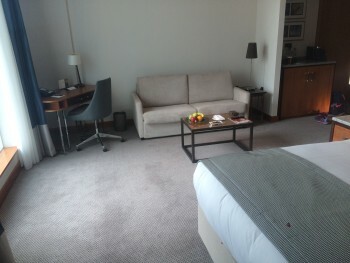 I thought the room was perfectly sized for two people (Deluxe King Canary Wharf – corner – 1102) and very comfortable. We took the River Boat from Embankment to the O2 dock – not because it was convenient but for the tourist factor (also the accompanying free audio guide app in:flow is excellent). 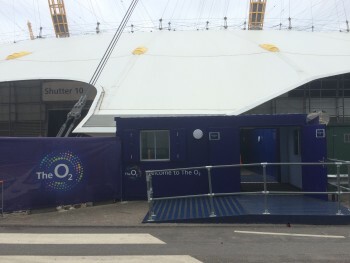 The hotel is a short 5-10 min walk from the O2 dock, the main sights in Greenwich are only a 25min walk along the Thames path from the hotel and the Thames barrier is a 45 min stroll (or 20 min jog) the other way. The gym facility was excellent and I also rated the pool, sauna, steam room highly as well. The hotel was not very busy during our stay (which meant we were able to check in at 10am). The only (very minor and easily resolved) hiccup was with the IHG MasterCard rate. It is supposed to include breakfast but that didn’t show on the hotel’s booking system. It meant that the duty manager had to be called during check-out, I had to present the voucher and show the booking confirmation on my phone (which I had to email to the manager) before they would remove the £25 per person breakfast charge. The Club supplement was £75 which wasn’t worth it given we had booked dinner at 7pm and breakfast (was eventually) included in our rate.